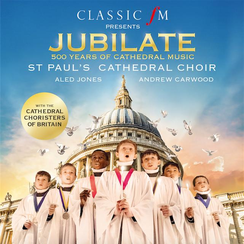 St Paul’s Cathedral Choir has joined forces with 50 young choristers from cathedrals across the UK for a new album entitled ‘Jubilate: 500 Years of Cathedral Music’, released by Decca Classics and Classic FM on 17th March. The cathedral super-group is directed by Andrew Carwood and includes former choirboy Aled Jones. Every copy of the album sold will raise money for the ‘Diamond Fund for Choristers’, which aims to help young choral singers and secure the future of cathedral music. It is supported by Classic FM presenter Alexander Armstrong – a former choirboy himself – who hails becoming a chorister as “the greatest leg-up a child can be given in life”. The album, which celebrates 500 years of cathedral music with a host of famous choral tunes, was recorded in the astonishing acoustics of St Paul’s Cathedral – with its 8-second echo. St Paul’s Cathedral Choir has been performing in London’s iconic venue for nearly 900 years, making it one of the world’s oldest and most illustrious cathedral choirs. The songs on the album span five centuries – from Thomas Tallis’ Salvator Mundi to Paul Mealor’s Ubi Caritas, with Handel, Mendelssohn, Vaughan Williams and more between. There is also a special arrangement by John Rutter of A Gaelic Blessing, sung by Classic FM presenter Aled Jones. Most of the music chosen for the album was written by composers who themselves were former choristers, from William Byrd and Henry Purcell (Westminster) to William Walton (Christ Church, Oxford). The young singers of St Paul’s are joined by 50 additional choristers (one representative from the vast majority of the UK’s cathedral choirs) for four tracks on the album. The massed voices can be heard in glorious sound on Handel’s Zadok The Priest, Parry’s I Was Glad and Rutter’s A Gaelic Blessing. The choristers of St. Paul’s Cathedral Choir are enthusiastic and highly trained, and used to a seven-day week including services on Easter Day and Christmas Day in the world-famous cathedral. In 2015, the choir released a hugely successful album of carols, which went to No.1 in the UK specialist classical chart.